This exhibition is a development from the Saari Residency from Kone Foundation in 2010. 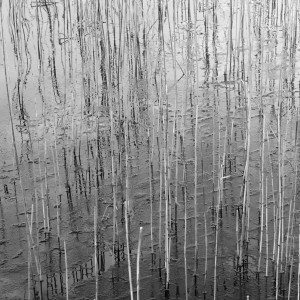 I am interested in the contrast of the white lines the reeds make when hung in a dark space and their very distinctive way of moving with the breeze. 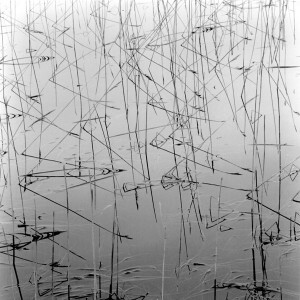 The reeds are given a new life hanging in the air, not fixed to the ground and therefore can move differently and be experienced differently. 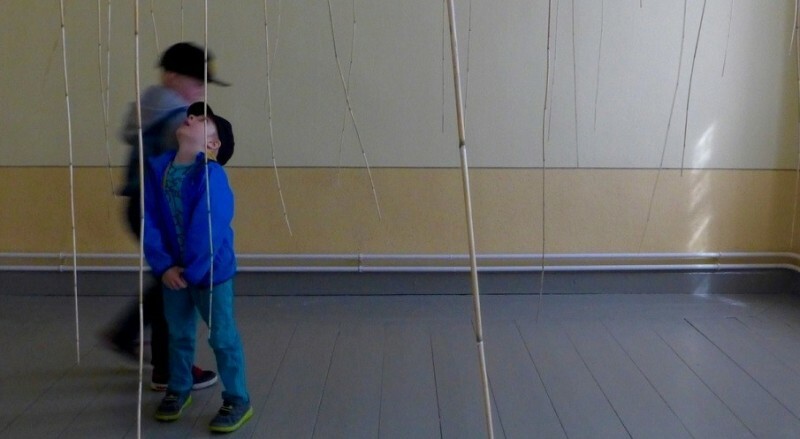 We physically experience how these new hanging reeds invade our known interior spaces. 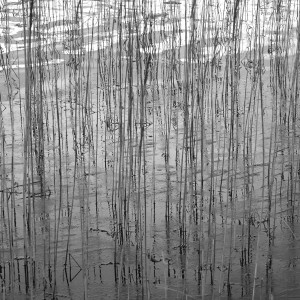 Reed, Phragmites australis, is a distinctive plant which under certain conditions becomes invasive, as in the Finnish archipelago, yet it is also seen as ‘amongst the most important habitats for birds in the UK.’1 I am interested in this contrast and what we need to understand when plants grow in an unbalanced way. This installation provides space to see this plant anew, listen to its voice, enjoy its physical delicacy, watch its balletic movement, think about our ongoing relationship with it and how to rebalance its growing conditions. The title Sonderingar / Luotauksia / Soundings is chosen for its multi layered aspect of meaning: the fact of giving out sound, the power of this, the action of finding the depths of water, having a sound, producing sound. 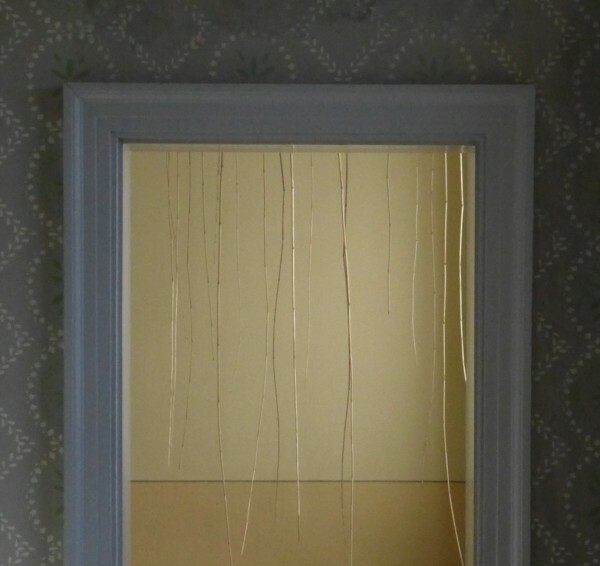 There are three parts: soundings I – installation, soundings II – sound piece and soundings III – photographs. 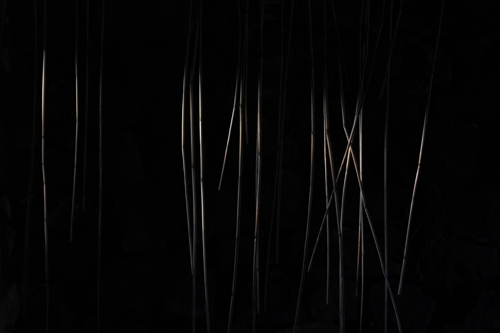 Soundings I – One of the main rooms in the Eckerö post-och Tullhus, a North-Easterly facing room 4m by 4m is filled with hanging reeds, a path winding through them. There is no visible means of support, the reeds, cleaned of dead leaves, glisten in their bone like whiteness and move with delicate grace in the breeze created by our movement. This installation is designed to bring out the magical aspect of Phragmites australis. soundings II – This sound piece was made with Nick Middleton on Skye. A looped soundtrack of winter reeds at Loch Suardal on Skye echoes down the stone stair as you enter the exhibition. 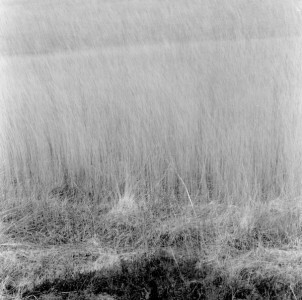 soundings III – A series of black and white photographs of reeds on Skye.